Lesvos once used to be a haunt of Pirates. The famous and powerful Barbarossa actually came from the island. Now when you drive along the shores, you might easily think that the island has returned to the blooming days of piracy: the shorelines are scattered with the wrecks of ships that lie like useless playthings in the lapping waves. Now with the weather tending towards winter, the Turkish smugglers are offering more luxury and real boats, that on first sight seem to be trustworthy, but in reality are just sinking tubs that when overloaded can barely reach the other side. The destroyed rubber dinghies are regularly picked up from the beaches, but the once colourful tourist boats, saved from the Turkish dumps for an olive bag full of money, are more difficult to remove and remain sad witnesses of risky rescue operations. On the sea the pirates have re-appeared. Cowards that they are, they do not hoist the skull and crossbones but, hiding behind masks on fast speed boats, they attack the floating refugees to take their money and cell phones and sometimes to destroy the motor – or worse – the inflatable dinghy. On many beaches rescuers tumble over each other to welcome the boat people to safety and warmth. They swim to boats that are in trouble close to shore, or jump into the waves to assist boats arriving full of screaming women and children. Afterwards they are as drenched as the people thanking Allah on their wet knees for their safe arrival in Europe. The village, which in the summer is a vision of scantily dressed people, is still offering that image with people dressed as for summer. Many of the rescuers come from cold countries so they are still embracing the beautiful autumnal weather as hot summer days. From under my woollen hat I sometimes have to peek if I see gooseflesh. But these people are so full of adrenaline that the autumnal wind with a cold winter pitch does not seem to get a hold on their bare arms and legs. Spying from behind their curtains the elderly of the village must be wondering at the sight of this parade of young people. The age of the visitors has significantly gone down. I guess that the average age of these helping hands is around 30 years, just a little older than that of the refugees. Some villagers think that these young people are gold diggers, not understanding that for no or little money they have come to this island to rescue the near drowning people. In Greece they are used to solving their problems on their own. The men look like sturdy pirates: nowadays having a beard is fashionable and thick sunglasses have replaced the eyepatch. The women parade with colourful hair or with a modest head kerchief. They come from all corners of the world, and as such all religions now are represented here. It must be their young blood, which sometimes make them behave like road hogs (in Holland we say: like road pirates). The rented cars – more used to the grandmothers pace of the usual 50-plus tourists - are stretched as never before, even on dirt and dusty roads. The vehicles on give the image of participants in the Dakar Rally. Now the North and the East of Lesvos and the capital Mytilini have all become hot spots for rescuers. If you go to other parts of the island, then the unusual stir is not present, and there the old Lesvos-feeling still exists: the peace and quiet of the island that does not fear time carries on as undisturbed as it has always been. Now is the time to gather the olives; no refugees will ever change that. This is an island with century old traditions and inhabitants (many who were so poor not long ago that they walked barefoot). Occasionally the olive nets may change colour and now more and more people, if they can afford it, buy little machines to shake the olives from the trees; but the hand-held long stick (dèbla) used for centuries to remove the olives from their branches, remains the most used tool. The unstoppable and increasing stream of refugees however has taken part of the island out of its lethargy. Tourism nearly collapsed at the end of the high season, but then the auxiliaries arrived: many businesses beginning to close for the season would re-open their doors and flights to the island again became overcrowded. Rescuers are no tourists: they work so hard that they barely know where they are. 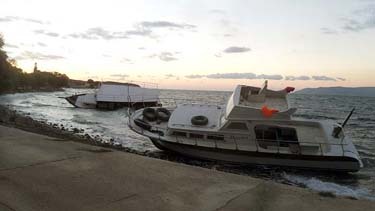 The largest number of refugees run ashore in the regions around the most touristic and praised villages of the island (Molyvos and Skala Sykaminia). The international troop of helpers is only left to guess what other treasures the island is hiding. They just get a tiny taste of the Greek hospitality and the sun. You may call Lesvos a bit anarchic: no authority ever gets a hold on the life here. Some islanders quarrel eternally about the best way to help the refugees and reached as much solutions as Europe did with its endless gatherings. Other groups did what all those rescuers did by coming to the island: when politics fail, you do it yourself. And so it is that Lesvos will face an historic winter. Molyvos and Skala Sykaminias can forget about their hibernation and Mytilini will have an extended season. These villages and the capital will fizz with activities and will be for once in the centre of world news, if only because they have become such tragic places. The refugee dramas will keep on building, the graveyards are already full; the island however will be helped by these young and decisive helpers, who like angels from heaven have flocked in numbers to the island.